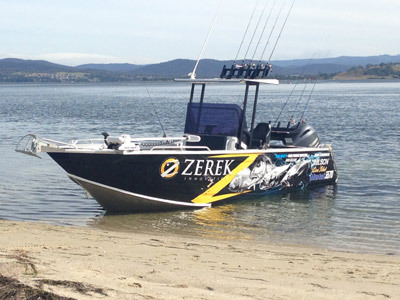 HATTRICK -Imagine being able to fish for Wild Tasmanian Trout or Big Tasmanian Bream or Fantastic fighting Salmon all within 15 minutes of your accommodation. Our charters have a maximum of 5 people to ensure quality fishing time and tuition for everyone. 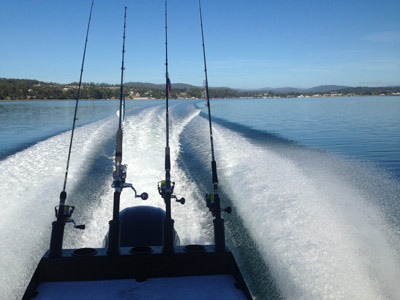 The variety of fisheries on the East Coast of Tasmania give us many options for catching bream and a large number of southern estuary species. I am constantly fishing and chartering in the area and my years of experience and knowledge allow me to guide you to the best places. Let me show you how to catch a variety of fish and experience new and exciting fishing techniques. We cater for experienced fishers, novice fishes and all levels in between. For multiple day bookings airport pick-up can be arranged. All you need is a warm jacket, sunglasses, hat and camera! The vessel is a purpose built 7.5m Barcrusher with an incredibly flat and stable fishing platform. The high fishing platform with the use of polaroids allows for casting to feeding fish.